"Spend Less Time on Twitter While Making More Money By Using This Easy To Use Script That You Control With No Monthly Fees!" 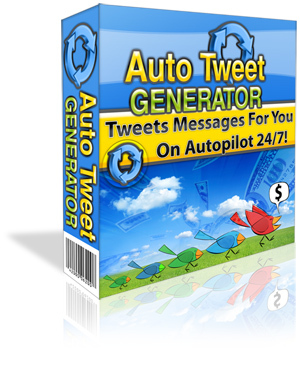 Sit Back And Relax And Give Your Twitter Followers Valuable Content While You're Away That'll Turn Them Into Raving Fans..
Auto Tweet Generator is a small php script you can use to automatically tweet your messages for you every day. It's the autoresponder for your Twitter account! You install it in about 5 minutes then login and setup your messages and your Twitter account is now sending your followers valuable content on autopilot! Once you have "ATG" installed, it will only take about 30 seconds to get going. And not to worry, full video directions are provided!